Dancers of the San Francisco Ballet - Soldiers, Harlots, Acrobats, et. al. 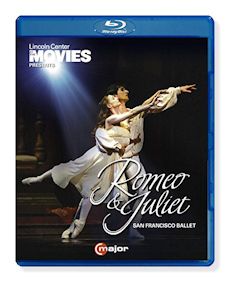 This production of Prokofiev's Romeo and Juliet ballet, featuring choreography by Helgi Tomasson and costumes and sets by the late Jens-Jacob Worsaae, has generally received very positive response from critics and public alike since it was introduced in 1994. It's easy to understand its success: the choreography is imaginative and brilliant and the sets and costumes are visually stunning. I'll get to the performances by the dancers and musicians, but there is one issue I often touch on in ballet reviews that I must raise once again. One of the first things I do when considering a ballet performance for review is to check its timing (usually shown on the back cover), as that one vital statistic alerts me to how substantially the work is cut. For better or for worse, cuts are the order of the day in most full-length ballet productions, no matter who the composer is, no matter how great a masterpiece the work is. Few critics ever complain, it seems. I'm a voice way out in the wilderness on this issue. With this new effort from the San Francisco Ballet, we have a fine production that, not surprisingly, is cut just like the other four versions of this work that I've reviewed here over the years. The timing of 116 minutes (a few minutes of which include curtain calls at the end) divulges that about a half hour is excised from what would be a nearly two and a half hour length in complete form. Granted, the work has fifty-two numbers, some of which are quite short and thematically repetitious – features that might well invite choreographers and producers to pull out the scissors. Just off the top of my head I can point out that in this rendition #7, The Prince's Command is cut as are #22 and #23, Folk Dance and Romeo and Mercutio, respectively. Also, the ensuing #24, Dance of the Five Couples, is cut short and the music rather abruptly goes into the next number, Dance with Mandolins. I won't bore the reader by detailing further cuts and adjustments, but I will say that while the cuts in this production are not artistically insensitive, I would still like to see a complete performance of the ballet, instead of one pruned to fit into about a two-hour (or less) time frame. Indeed, if this is a monumental masterpiece – as is widely believed – why would certain portions need to be cut to fit a choreographer's take on the work? Now, as for the performances from the dancers, they are quite fine, right down through the cast. Maria Kochetkova is exceptional as Juliet, her movements always graceful, supple and beautiful. Her facial expressions early in the ballet radiate an ingratiating childlike innocence and joy, but in the darker and more tragic moments later on transform subtly to frustration, fear and sadness. She is a fine actress and a great dancer. Davit Karapetyan makes a splendid Romeo: his dance scenes with Juliet exude passion and deep love, and his sword fight with Tybalt divulges both exceptional athleticism and gracefulness. Luke Ingham in the role of Tybalt is also very convincing, both in his dancing and acting skills. As suggested above the remainder of the cast is also quite good. Martin West leads the orchestra with a fine grasp on Prokofiev's style, though there are a few instances when the playing may lack a little bit of spirit. But then, there are moments when "spirit" comes on strongly, perhaps too aggressively. Overall, however, the orchestral contribution here is strong and fully competitive with that of other versions on video. As mentioned at the outset, the choreography of Helgi Tomasson and sets and costumes of Jens-Jacob Worsaae are first-rate, as are the camera work and sound reproduction. One aspect of this C Major Blu-ray disc that may be a negative factor for some potential buyers is that it contains only twelve tracks, many dance numbers combined into a single access point. Track 3, for example, has 28:33 worth of music and action, and a couple of others are in the twelve to fifteen minute range. This won't be a factor for most viewers, but if you tend to watch excerpts, or want to access portions of the ballet to play for friends, it may well be. As for the competition, it is rather fierce, especially on CD with excellent renditions by Maazel, Previn, Ozawa, Gergiev (with the LSO) and Petrenko. But since this is a video under review, let's stick with that format. Previously I have reviewed a version from Teatro alla Scala on a TDK DVD with conductor David Garforth (TDK DVBLRAJDVD EuroArts DVD 205007), a Bolshoi production led by Algis Zhuraitis on an Arthaus DVD (Arthaus DVD 100711), an excellent Paris Opera version with choreography by Rudolf Nureyev on a Kultur Blu-ray (Kultur/NVC Arts Blu-ray BD2102), and finally a Barry Wordsworth-led production from Covent Garden on an Opus Arte Blu-ray (Opus Arte Blu-ray OABD7116D). Of these the last two are the strongest, but because the Paris effort dates from 1995, I have generally preferred the better-recorded Covent Garden performance from 2012. Okay, how does this new San Francisco effort compare with it? Well, the Covent Garden, with Kenneth MacMillan's choreography, is nearly a complete version of Prokofiev's score and features just as strong a cast of dancers and equally fine orchestral playing. But the San Francisco offers more opulent sets and costuming, and has the edge in lighting effects. It's a tough choice and either one will offer you great enjoyment. If you want the score complete – or nearly so, the Covent Garden is to be preferred, but for visual beauty the San Francisco production must be given the edge. This new disc also offers some interesting bonus features. Your move.